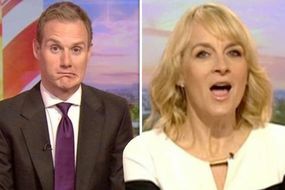 Dan Walker, 42, replaced Bill Turnbull, 63, on BBC Breakfast in 2016, joining Louise Minchin, 50, who has appeared on the programme since 2006. Now, the presenter has revealed how the pair really get on off-camera, admitting they often get each other out of “trouble”. Spilling all, she told The Mirror: “I think that we’re both team players, and so many times Dan gets me out of trouble or I get him out of trouble. I know that Dan is 100 per cent going to back me up, and, you know, things happen on the programme and mistakes are made, and we’ll always help each other out in that situation. She added of her co-star: “They’re not gonna let you down, they’re not going to do something mean, they’re not gonna say anything horrible, we are a team. Dan shared similar views of his co-star, describing them as a team with a “good relationship”. During the same interview, Football Focus star Dan also shared his thoughts on the rivalry between BBC Breakfast and Good Morning Britain.